With it's mildness at the palate and the fruity taste of fully ripe apricots on the tongue, this spirit, with adidditon of delicate apricot-distillate, can already celebrate it's success over the borders of Austria. Only the best fruits get used for the production by the delicate distillery Prinz from Hörbranz. For having the full taste of the apricots in the distillate, they only use low temperatures to have a gentle burning process. The fresh distilled schnapps gets storaged for many months in the so-called "Hafele" (Earthenware vessel) to have less sharpness. Unwanted taste notes are getting filtered out over the air exchange through the micropores in the stoneware. On the other hand can important taste nuances and aromas get developed. The excellent basic products, care and patience in manufacturing, as the practical knowledge over generations make this Prinz Hausschnapps to this distinctive original out of apricots. 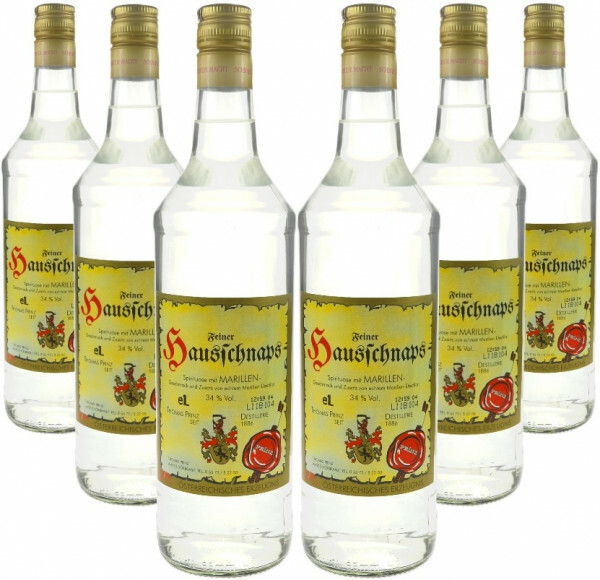 Related links to "6 bottles of Prinz Hausschnaps Marille 1,0l - apricot fruit brandy"
Customer evaluation for "6 bottles of Prinz Hausschnaps Marille 1,0l - apricot fruit brandy"